"This paper uncovers a new fact: non-durable inflation for poorer households has been substantially lower than for richer households. 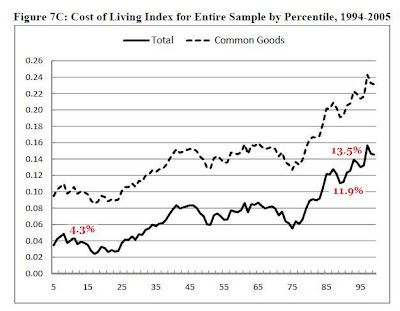 Using scanner data on household consumption of non-durable goods between 1994 and 2005, we document that the relative prices of low-quality products that are consumed disproportionately by low-income households were falling over this period. This implies that non-durable inflation for the 10th percentile of the income distribution has only been 4.3 percent between 1994 and 2005 (0.4 percent per annum), while the non-durable inflation for the 90th percentile has been 11.9 percent (1.0 percent annually), and 13.4 percent (1.2 percent annually) for the richest 5 percent of households in the sample (see chart above)." This fact implies that measured against the prices of products that poorer consumers actually buy, their “real” incomes have been rising steadily. 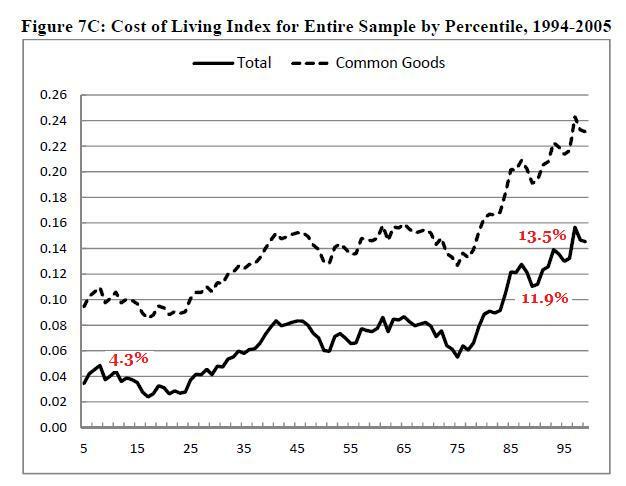 As a consequence, we find that around half of the increase in conventional inequality measures during 1994–2005 is the result of using the same price index for non-durable goods across different income groups. Moreover, given that the increase in price dispersion does not seem to be specific to our sample or time period, the overstatement in the increases in inequality from official measures can be even more significant, changing our view of how progress has been distributed in recent decades substantially." MP: In other words, by using a single price index to adjust incomes for inflation, the findings of rising income inequality have been exaggerated. Because non-durable inflation (food, clothing, fuel, cosmetics, paper, etc.) for consumers in the 10th percentile was 7.6 percent lower than inflation for the 90th percentile between 1994-2005, and 9.2% lower than for the 95th percentile, about half of the increase in income inequality during this period was the result of using the same price index for all income groups. However, that still says they're getting junk. If that's all they really can afford, getting more of it isn't an improvement. What if it's not just differential inflation between income earners that's behind the increased income inequality the official statistics report over that period. I wonder how well controlled the data indicating growing income inequality is for major demographic changes within the U.S. over the period where income inequality is believed to have increased. Given what we know about the birth rates of the baby boom generation from 1946-1964 and the previous generation who would be exiting the workforce during that time, we should see just that in the early years of the baby boomers reaching their peak earning years (from 1991-2000), followed by an upward shift in the number of income earners at nearly all income levels from 2000-2006 as the number of baby boomers in their peak earning years peak, at least in the absence of recessions. I would put 2006-07 as the cutoff since that would coincide with being the age of retirement for high income individuals (about 60 years old), which would be the age that the first baby boomers born in 1946 would be at that time, after which the number of high income earners potentially skewing the income inequality statistics would begin to fall. add this to the shift in assets from tangible to financial & the shift in income to sub status from C corp, we must wonder if we are treating a disease that has been poorly diagnosed, similar to the overstatement of the uninsured. As sethstorm points out, if the more affluent are paying consistently more, they are probably buying more upscale versions of products. Assuming people know what they're doing, this is a pretty poor shoot-down of income inequality. I hear a lot of complaints about the whining of the poor, but countering that by envying the poor their thrift: that's pretty pathetic. Let's cry our eyes out for the wealthy. True, they are living better than anyone in all history, with more creature comforts, better health care and opportunities than royalty of just a generation ago. And true, the wealthy have a dedicated cadre of sychophantical catamites, who sally forth of tearful missives on their behalf if ever it appears they might be taxed as heavily as the middle class. Still life is hard for the millionaires of America--the price of luxury goods is rising more quickly than stuff found at the 99 cent stores. of course the wealth buy nicer stuff. that is to be expected. what this differential means is that it's more difficult for the wealthy to maintain their standard of living. thus, in real terms, their income is not going up as much as it appears because they are experiencing 2.5 X the inflation. the point is that it takes more nominal income growth for them to stand still in real terms. it's much harder to stay where you are in real terms in the "rich" that the middle class. But the US is the land of the posted retail price. I don't think it's the case that a guy in a store is charging you more because of what you wear. As MP keeps posting, TVs, cellphone, and other consumables are dirt cheap compared to housing, insurance, and other items that are generally in the "non-discretionary" budget column. Members of the 6-figure club shop in different stores, live in different neighborhoods, and in many cases go to different schools. In most cases, the inflation is just the cost of separation from those with less money. Well fine. But is that really supposed to garner sympathy from anyone? So, if a middle class worker loses his job to outsourcing and with his new Mac Job he can no longer afford steak but eats hamburger instead and the price of hamburger goes down because volume goes up then the worker is better off than when he had a real job. This study is the product of the ivory tower. "In most cases, the inflation is just the cost of separation from those with less money. Well fine. But is that really supposed to garner sympathy from anyone?" The amount of sympathy garnered should probably equal the amount of outrage we feel about income inequality. In other words, none of either. my point is that the salaries of the "rich" could be up .9% a year and the salaries of the poor up .4% and one might erroneously conclude that the rich were doing better than the poor when in fact they lost out in real terms while to poor gained. theoretically, a consumer should not care if their income increases or prices drop. a fixation on nominal data sometimes occludes more that it reveals. Will Higher Inflation Help the Economy?